We don't have a president, what we have is a celebrity running around the country, appearing on the tonight show, going on vacation and hob-nobbing with the ultra rich. He is doing nothing about the problems with the economy, jobs, and so many problems in the middle east. What he IS doing is making matters worse with his policies that aren't working. He's about as incompetent as anything we've ever had. I don't know if this country can stand another three years of him. Four hundred American surface-to-air missiles were 'taken from Libya' during the terror attack on the U.S. consulate in Benghazi, a former U.S. Attorney who represents whistleblowers claimed on Monday. 'A lot of people have come forward to share information with us,' he said during the radio station's 'Mornings On The Mall' program Monday morning. For the life of me, I can't understand why these missiles were there in the first place. Just another example of the incompetence of this administration. We all know that Obama is perhaps the most liberal president in the history of this great nation. But, he has recently compared the struggle being taken by the Muslim Brotherhood against the Egyptian military to the path that the United States took to democracy. This almost boggles the mind, but at the same time, I think it is quite instructive into how the mind of a liberal actually works. Countries that are transitioned out of a military government towards a democratic government and it did not always go in a straight line and the process went smooth. Um. There are going to be false starts. There will be difficult days. America’s democratic journey took us through some mighty struggles to perfect our union. Now, after reading that statement you might be wondering to yourself whether this idiot even thinks about what he says beforehand or if he is spouting at the mouth. Of course, there are obvious factual errors with what was said. For one thing, to say that what is happening in Egypt right now is a journey is kind of silly. It trivializes the real people who are spilling their own blood over their for the cause of freedom. The key word here is cause. This is proverbial steel cage match to the death between a secular government and a group of fanatical Muslims whose ultimate goal is not simply control over Egypt, but to enslave the entire world and will think nothing of committing genocide against the Jews, Christians, and whatever women they happen to encounter along the way. Yes, some journey! Also, it is kind of strange to compare America’s path to democracy with a group that uses death, torture, and enslavement as their primary weapons of choice. America was never ruled by a military government, either. So, yes, there are a lot of factual errors when Obama’s statement is taken at face value. I think it's becoming crystal clear to the majority of the American people that he's totally incompetent without a clue on foreign affairs and how to deal with the economy and unemployment at home. However, you have to give him credit, nothing keeps him on the job and away from his lavish vacations and golf game. POLITICALLY CORRECT. A term used by whiney, over sensitive pansies who need everything sugar coated for them. If Obama had a son it would look like Trayvon, if he had a city it would look like Detroit, if he had a country it would look like Cuba. Matt Walsh posted this apology letter to Obama regarding the clown mask. He is a blogger and radio host. I’m reaching out to you as a friend. I know you must be deeply hurting after what happened at the Missouri State Fair. Sure, you probably try to avoid watching the news while you’re on vacation, but I’m sure the pilot who airlifted your dog to your rental mansion in Martha’s Vineyard probably caught you up to speed (that guy is such a chatterbox). Your jaw must have hit the floor when you heard the news: A rodeo clown in Missouri poked fun at you. Yeah, I know, almost impossible to believe. The gall! The gumption! The racism! Don’t worry, the entire country erupted in outrage, Democrats and Republicans issued statements of condemnation, and now the offending clown has been banned for life from the Missouri State Fair. There will likely be “action taken” against the Missouri Rodeo Clown Association, and I do hope justice is visited upon them swiftly. I think we’re all a little sick of the Missouri Rodeo Clown Association causing trouble. It’s something new every week with those freakin’ guys. But all of this is of no consolation. The fact is, a rodeo clown in Missouri made fun of you. Nothing can ever ease the pain he has caused. This sort of crass lampooning of public officials has never happened at a rodeo until now, and I know that because a bunch of people who have never been within 150 miles of a rodeo said so. And then — worse still — the crowd erupted in applause at the spectacle of a guy in an Obama mask being chased by a rampaging bull. Racists, the lot of ‘em! I mean, Bush never got this sort of treatment. Nobody ever mocked or satirized him. No crude jokes were told about him. Nobody ever wished violence or death upon him. Ever. You know why? Because he’s white. White presidents always get treated nicely, especially white Republicans. Just ask Lincoln. The whole country agreed for over two centuries that we don’t ever insult presidents, then you get into office and all of a sudden every day is Pick on the President Day. Outrageous! Besides, you are due some respect. You’ve earned it. You’ve done nothing but serve these people and make their lives better, and this is how they treat you? Ungrateful brats. You should drone bomb these haters. Just kidding. But seriously, you should. You’re the first president in history to actually order the assassination of American citizens, and I say why stop with some Muslim propagandist and his completely innocent son who never committed any crime at all? I’m especially sick of these punks in the middle class who won’t stop complaining about you. What’s their issue? OK, you haven’t done anything about the unemployment rate your whole time in office, median household incomes have dropped, fewer businesses are opening, the number of people in poverty has increased while the number of high paying jobs has decreased, all of this while taxes go up and Obamacare looms, threatening to strangle small business owners and put thousands more out of work, but so what? I’ve got two words: Food stamps. Or is it foodstamps? I don’t know, I can’t spell it, I can just use it to get my Lucky Charms and Dr. Pepper. You’ve made all of this “work” crap obsolete by increasing the entitlement state more than any president ever in history! You’re adding more than 11 thousand Americans a day to SNAP. You’ve got millions relying on the government for rent, cable, phone, even birth control. I guess this horrible economy stuff would be kind of a bummer if not for all the delicious welfare. Who needs an economy anymore? We’ve got you, baby. So how could anyone be upset at you? How could they delight at the degradation and mockery of Barack Obama? What’s wrong with these right wing rednecks? Are they still sore about the whole thing where you sent the IRS after your political opponents to harass and hinder them during an election cycle? Or the stuff about spying on the phone records of every American? What about all this business about you arming and funding Islamic Militants overseas and then orchestrating a coverup when a bunch of them murdered your ambassador? Are folks STILL mad that you funneled weapons to drug cartels and then threatened whistleblowers into silence? Or is it all this fuss over your Justice Department spying on and attempting to prosecute journalists? Is it the wildly unpopular two thousand page health care law? The regulation mandating that religious employers provide abortifacients to their employees? The millions of tax dollars you’ve given to the abortion industry and the blessings you wished upon a group of wealthy abortionists? The bailouts? The green energy scams? The massive expansion of government? The out of control deficit spending? The lies? The broken promises? The betrayals? The corruption? The attacks on our fundamental liberties? I can’t imagine why anyone would get too worked about any of that. Like you said, that stuff didn’t happen. Or it did, but it’s not a big deal. Or it’s not a big deal because it didn’t. I can’t remember, I just know that you treat anyone who raises any of these concerns with utter contempt and disregard, which clearly proves that they are wrong. Mr. Obama, IF you WERE actually guilty of being a deceitful despot who murders, conspires, and steals, then obviously all true Americans would have no choice but to giggle with glee at the sight of your likeness being gouged by an angry bull. Fortunately, that isn’t the case, which is why I’d like to apologize for the state of Missouri, for everyone who has ever attended a state fair, and for everyone in the rodeo clown community. You are special, Mr. President, and I still love you. That sounds about right for our wussy president. Its no wonder that our King is going to be pissed at you two guys, but so is 716. Racism and portraying attempt to hurt president is not comedy and even appropriate comedy is not appropriate at a state fair. NEW: State fair commission bans clown after Saturday night's "unconscionable stunt"
Lt. Gov. Peter Kinder says "We are better than this"
(CNN) -- A rodeo stunt at the Missouri State Fair has come under criticism after a clown donned a Barack Obama mask and stuck on a broom that descended from his backside. The stunt took place during the bull riding competition on Saturday night. Rodeo announcer Mark Ficken, president of the Missouri Cowboy Rodeo Association and a school superintendent, announced a special guest: "President Obama." Another voice is heard over the loudspeaker working up the crowd and saying, "We're going to stomp Obama now." "As soon as this bull comes out, Obama, don't you move," the second voice said. "He's going to getcha, getcha getcha, getcha." "Hey, I know I'm a clown," the second voice said. "He's just running around acting like one. Doesn't know he is one." The stunt sickened Perry Beam, who came to the fair in Sedalia with his wife and a student from Taiwan to "give him a little piece of Americana." Beam likened the atmosphere to a Klan rally. "It wasn't clean; it wasn't fun. It was awful; it was sickening," Beam said, "It was racist." The student, Jameson Hsieh, recorded a video of the incident, but had little to say afterward. "He didn't say anything. We rode all the way home in silence," said Beam, who lives 50 miles away in Higginsville. "We were just ashamed, and he didn't ask any more questions. I think he had seen enough. It is just disgusting." Condemnation came from organizers and politicians alike. The Missouri State Fair Commission called it "unacceptable" and said the clown has been banned "from ever participating or performing at the Missouri State Fair again." "The commission reiterated that the statements and actions Saturday night were inappropriate and not in keeping with the fair's standards," the agency said in a written statement. "The Missouri State Fair apologizes for the unconscionable stunt." The board of directors at Missouri Rodeo Cowboy Association also issued an apology. "The Sport of Rodeo is not meant to be a political platform. We are taking measures by training and educating our contract acts to prevent anything like this from ever happening again," a statement on the group's website said. "All Members of the Missouri Rodeo Cowboy Association are very proud of our Country and our President." And Republican Lt. Gov. Peter Kinder called for those responsible to be held accountable. "I condemn the actions disrespectful to POTUS" -- president of the United States -- "the other night," he said in a post to his official Twitter account. "We are better than this." U.S. Senator Claire McCaskill echoed Kinder. "The state fair is funded by taxpayer dollars, and is supposed to be a place where we can all bring our families and celebrate the state that we love," she said. "But the young Missourians who witnessed this stunt learned exactly the wrong lesson about political discourse, that somehow it's ever acceptable to, in a public event, disrespect, taunt, and joke about harming the president of our great nation." Yeah, we all know buddy, anything you say or do regarding Obama is automatically racist. Bunch of whiney a$$ liberals! Hypocrites all!! Stockman said the NAACP would better serve its constituents by focusing on ways to decrease unemployment among the black community. He also noted that the national civil rights group was silent after a July incident on a Florida bus where three black teens beat a fellow white student. Though Gulfport Police Chief Robert Vincent told Fox News the attack did not appear to be racially motivated, former Florida Rep. Allen West, who is black, chided Al Sharpton and Jesse Jackson, noting they condemned Florida's laws in the wake of the Trayvon Martin shooting yet remained mum on the bus attack. 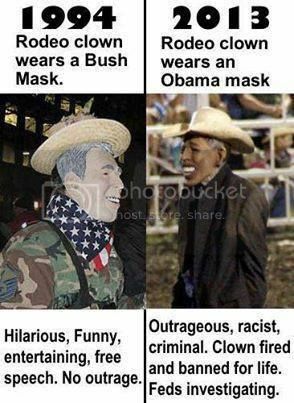 Hey buddy where was your outrage when a Rodeo dummy wearing a Bush mask was mauled by a bull? Oh yeah you were residing on Hypocrite Street that day "RIGHT". Obama is a pu$$y and everyone knows it. He and his followers could use a good dose of manhood. Every town has it's village idiot, Hazard is no exception. However the one in Hazard wants everyone to think there's quite a few there by posting under numerous usernames. But we all know there's only one of any significance. He's head and shoulders above anyone else. I don't think it was a clown. I think it was Obama in person. All the people was rooting for the Bull. Of coarse I had a snort of Kentucky's finest and I was rooting for the Bull too. I don't see how anyone could mistake Obama, for any thing but a Joke. It was meant to be humorous and this isn't the 1st time they had done it. They did it on GW back when he was president but, he laughed it off. Goes to show a Republican is treated differently than a Democrat. As for me I wasn't here in 1994. What I posted referred to what happened now and that time nobody had brought up any prior issue. No it wasn't appropriate in 1994 either but this was likened to a Klan event. I don't think anything in 1994 was done with a racist tone. Whehter we admit it or not there is a lot of racism and racial hatred of this president and a lot of inappropriate things of racist nature have happened attacking, mocking the president. Racism in 2013 is uncalled for or any time for that matter. I don't think anyone can deny there have been a lot of unfortuante incidents attacking this president based on race. The only racist thing about this is you idiots trying to make it racist. This is still a free country and we have a constitutional right to criticize and make fun of our leaders. Every time anyone does to Obama what has been done to every president since Washington you guys drag out the race card. Typical hypocrites and crybabies. Where was the Out Rage?